The rain stopped during the night and dawn came up clear and cold. We left the motel in Caro around 9am favored by a northwest wind, with a 100-mile expanse of farmland and small towns separating us from Ontario. 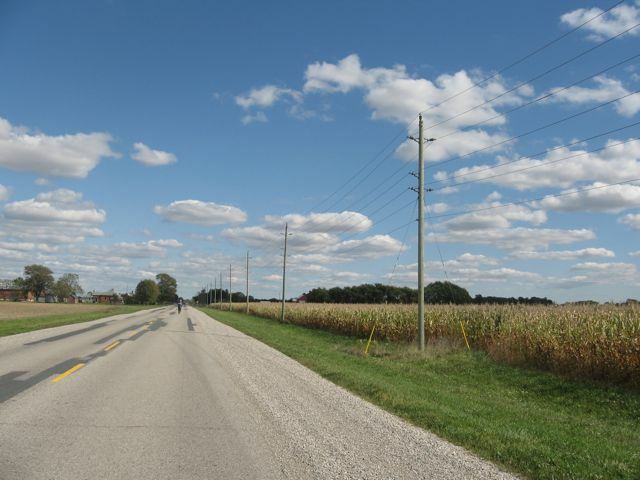 We were following Adventure Cycling’s route, so most of the ride was on flat straight county roads with cultivated land on either side. 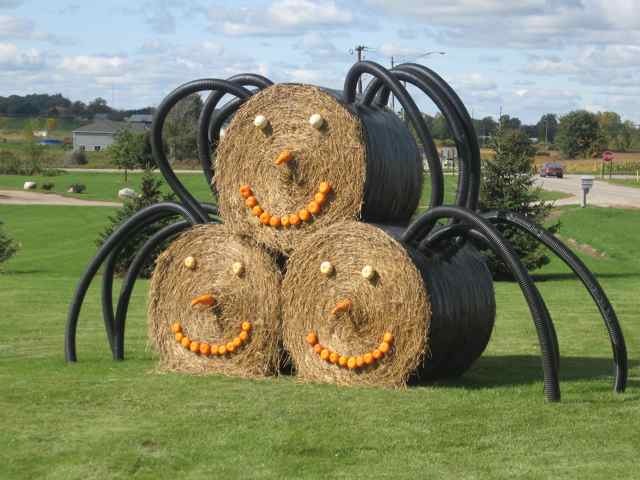 There was not much to talk about and not many reasons to stop, although we did see some cool Halloween decorations. We rode 30 miles before our first stop in East Branch, where a young waitress with French braids served us cinnamon toast. The walls were covered with photos of another young woman who had reigned as a rodeo queen. The young waitress told us that the queen had moved away. Two other towns we saw were also places where important things had happened long ago. 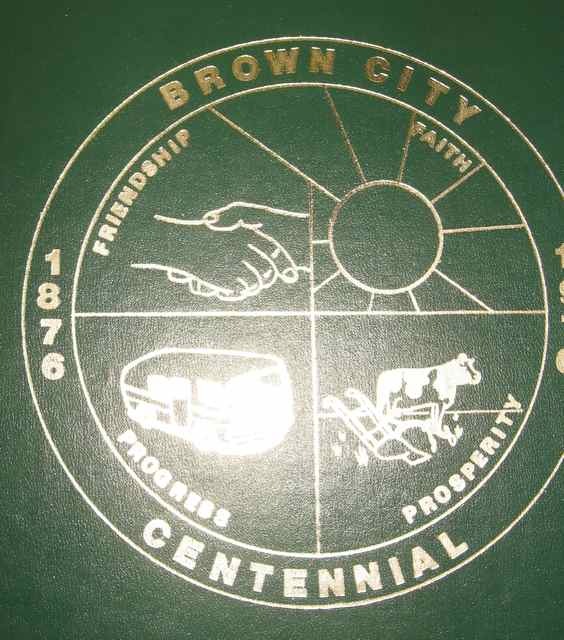 In the small town of Brown City, Ray Frank got an idea while he was playing around in his garage fifty years ago. He welded a trailer onto a truck. Then he ignored the jeers of his neighbors, packed his family into the contraption, and drove it to Florida. It worked so well that his friends began asking him to make them one, too. He originally sold them as “Frank Motor Homes.” As business grew, the company was re-named Travco. Ray later sold a line of motor homes under then name Xplorer. Now it seems that every baby boomer wants a personal bus. Jim and Sara had me over for dinner in theirs every night. Further down the line in the town of Memphis, we passed a historic marker with the headline, “The Thing.” It continued, “Thomas Clegg (1863-1939) and his English-born Father, John, built The Thing, the first recorded self-propelled vehicle in Michigan (and perhaps in the country), in 1884-85. The Thing, driven by a single cylinder steam engine with a tubular boiler carrier in the rear, seated four. The vehicle was built in the John Clegg & Son machine shop in Memphis. It ran about 500 miles before Clegg dismantled it and sold the engine to a creamery. The shop was razed in 1936, just before Henry Ford offered to buy it for Greenfield Village.” The backyard where The Thing emerged still has a few weird metal things in it, but no other signs. Those crazy guys tinkering in their shops. What will they come up with next? We had done 70 miles when we reached Memphis. It was 4pm, we had been averaging better than 14 miles an hour, and we still had some snap in our legs. 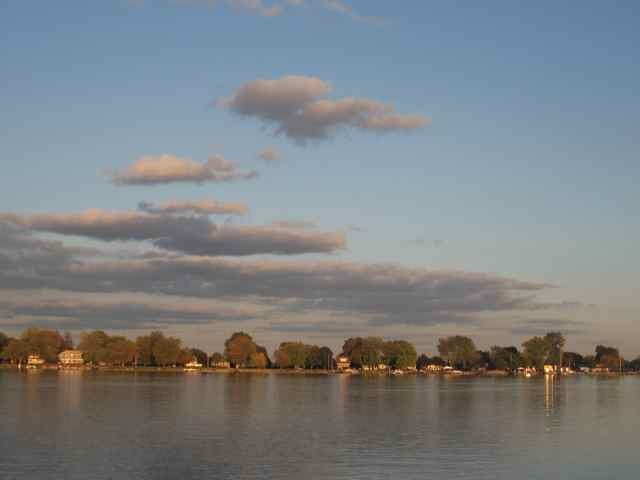 We decided to go for a 100-mile day and end at Algonac State Park, near the ferry to Canada. 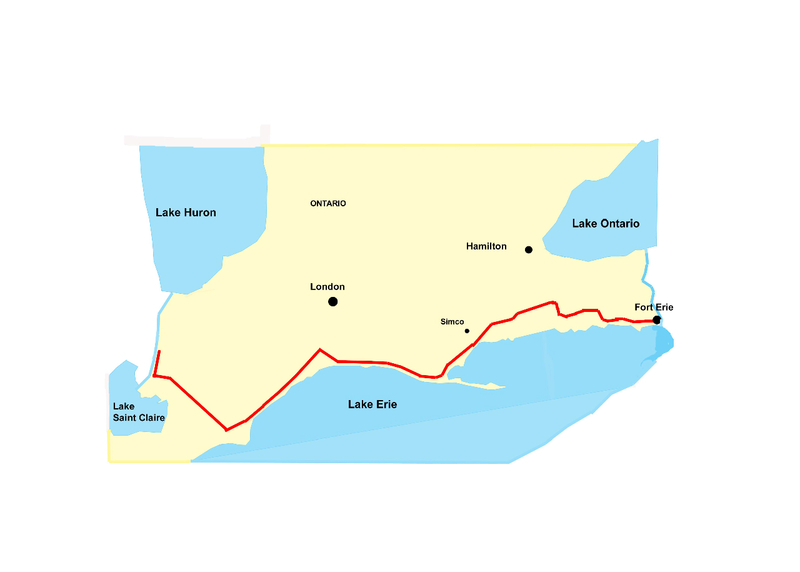 The last 15 miles were on the Bridge To Bay rail trail, which runs along Lake Huron, the St. Clair River, and Lake St. Clair. It was a bonus not to have to look at cars and traffic at the end of this long day, when we were tired and oxygen-deprived and more likely to make mistakes. The state park was more like a huge RV parking lot. 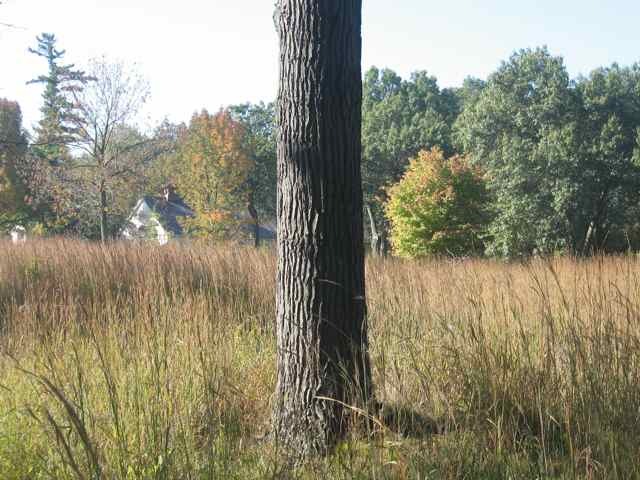 A grove of ash trees had shaded the lot until recently, when they were destroyed by ash borers. We arrived as the sun was setting. My daughter Emma and her boyfriend Jon showed up a couple of hours later, and we all wedged into the camper for hamburgers and jolly conversation. It was cold, down near freezing, when we climbed into our down cocoons for the night. Emma and Jon are good company, and I was touched that they drove more than three hours from Oberlin College to see me. They were so bright and energetic that we old folks just watched them and marveled. We groan whenever we get up out of chairs. They play lacrosse and Ultimate Frisbee. We struggle to remember names and places. They take college courses in organic chemistry and molecular biology at the same time. Yet they seemed impressed by what we were doing, which made us feel better. 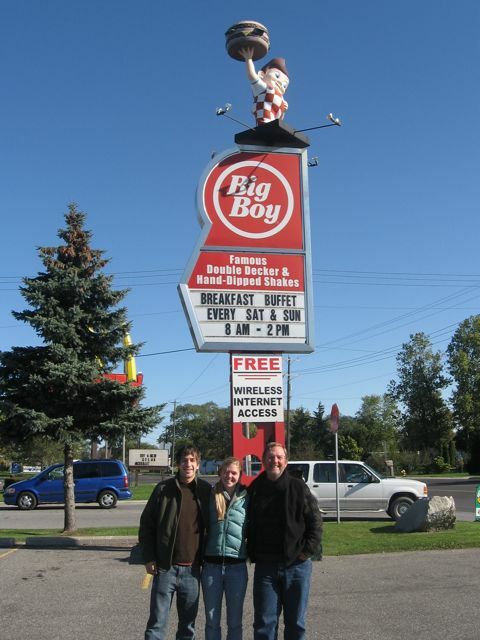 We drove down the road and had Big Breakfasts at Big Boy, a Midwest landmark that has special childhood significance to Emma. Then they left to go back to work, and we broke camp. 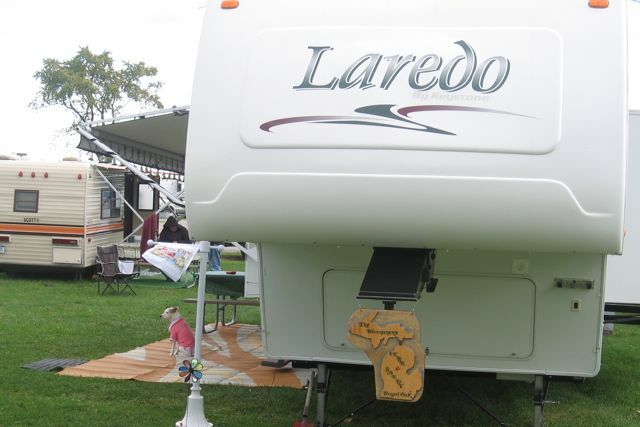 RV park culture was in full flower at Algonac. The rigs were decorated with colored lights, and some people had hung carved-wood signs with their names and home towns on their propane tanks. The style is to put a large square of indoor-outdoor carpeting next to the entrance of your rig, and also to put a pink sweater on your small dog. The whole scene had a bizarre cast. The campground was wedged between a busy highway on one side and a shooting range on the other, so starting at 9am there was the constant sound of gunfire and traffic. Yet the place was full. People had driven up from Detroit to spend the weekend here. Why? 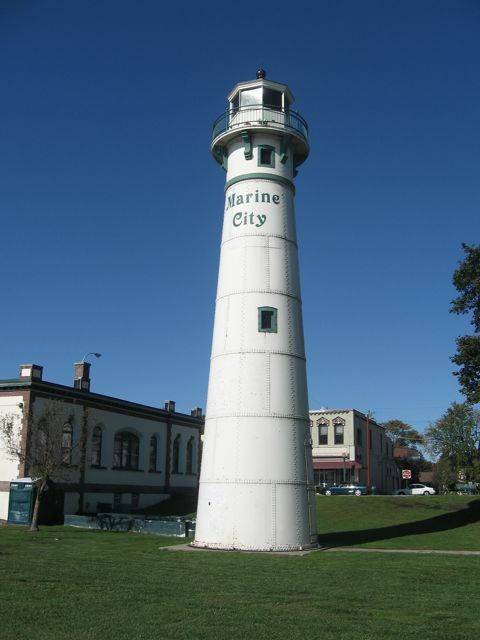 Marine City has two small ferryboats that go across the St. Clair River, which is maybe 500 yards wide. Only one Homeland Security officer was on duty there to protect us from terrorists, but he was extra-nasty and didn’t allow me to take any pictures. So while we waited, we walked down the street. 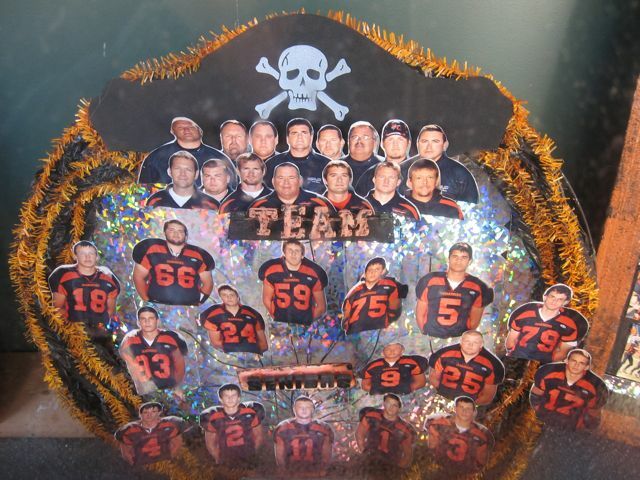 It was Saturday morning, October 4th, and we saw the leavings of the Marine City Pirates’ high school homecoming game, which had happened last night; I didn’t learn the score. 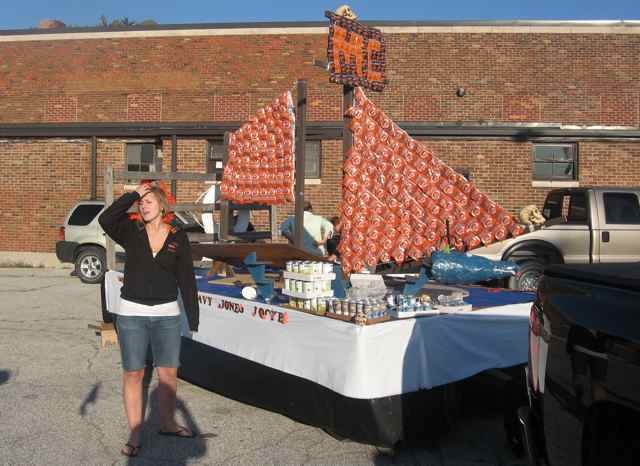 On the rail trail we had ridden past students dismantling one of the parade floats, a pirate ship which sails made out of bags of potato chips. The ferry ride was quick and the Canadian policeman let us right in, although she did insist on seeing our passports. We drove a few miles into Canada before unloading the bikes. We started off around 2pm with 50 miles to our destination, Rondeau Provincial Park on the north shore of Lake Erie. Most of the ride was south through more agricultural fields, but there were subtle signs that we were in a different country. The roads signs were in French and English, of course. More intriguing were the political posters for Ontario’s elections, which are also coming up. The Conservative Party’s signs up here are blue, and the Liberal Party’s signs are red. We rode into the town of Dresden, where we ate potato soup and grilled cheese sandwiches at another diner where the locals acted like they had never seen men wearing black tights. Then we rode just out of town to the site of “Uncle Tom’s Cabin,” which is what the government calls the residence of Josiah Henson (1789-1883). Henson was born a slave in Maryland. 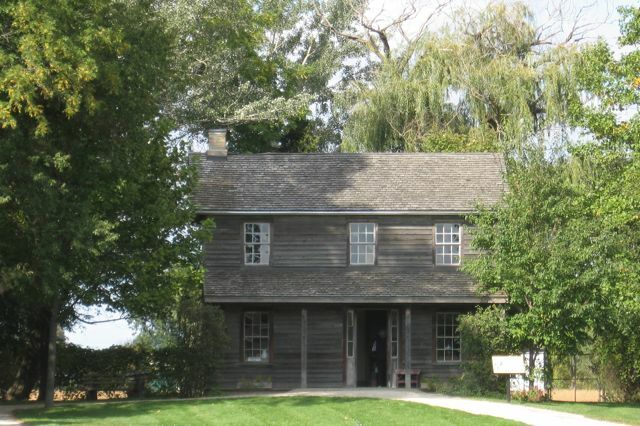 After escaping to Ontario with his family, he became an abolitionist leader and bought a 200-acre farm here in 1841. He ran a vocational school for slaves who escaped on the Underground Railroad, and his memoir, published in 1849, inspired Harriet Beecher Stowe to write Uncle Tom’s Cabin. Henson later presided over a black community named Dawn, and he continued to organize after slavery had been abolished in the U.S. His home site now has a large interpretive center that details the experiences of the African diaspora in Canada. It would take several hours to see it. We didn’t have the time, so for the thousandth time, we vowed to come back. Most of the ride happened on a flat, straight provincial highway called Kent Bridge Line (roads are called “lines” up here). It was harvest time, and we rode past threshers cutting wheat and field workers picking plum tomatoes. At one hamlet we saw an intriguing sign about the personal habits of Wendy; I don’t know the details, but feel free to call the phone number if you’re curious. We pulled into Rondeau Park around 6pm and set up camp. Tomorrow would be another short day. 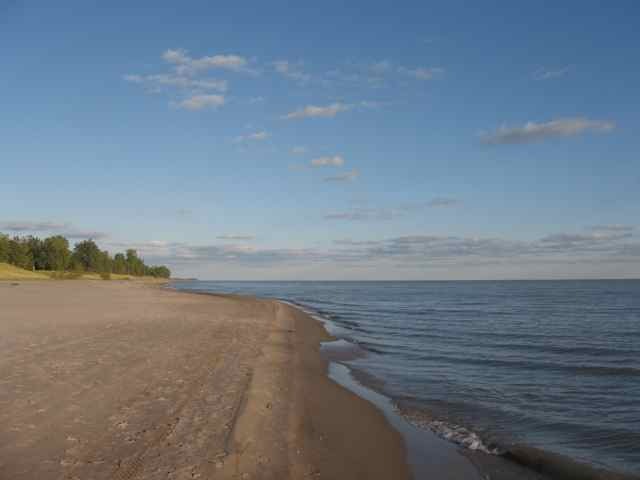 We should have time to look around the park before we start heading east along the Canadian shore of Lake Erie. 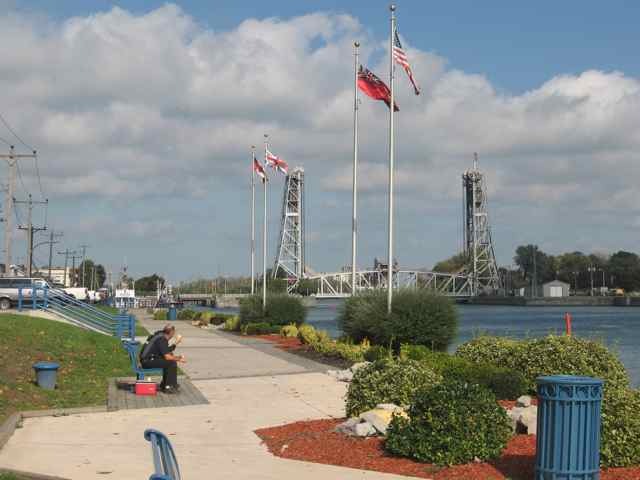 We crossed the St. Clair River on the Blue Water Ferry at Marine City and started through Ontario on Saturday afternoon. We will continue on the Adventure Cycling Association’s “Lake Erie Connector” route until we leave Ontario at the Peace Bridge in Buffalo at the end of the day on Thursday, On Saturday we went east from Wallaceburg and south on provincial route number 15, the Kent Bridge Line (they call roads “lines” here), to a campsite at Rondeau Provincial Park. On Sunday we rode east on provincial route number 3, the Talbot Trail, until it veered to the north; we stayed south on smaller roads that hugged the lake shore. We stopped the bikes in Port Stanley but continued in the truck to St. Thomas, a larger town a few miles away, because the truck needed repair. We continued east on Monday from Port Stanley on small provincial roads along the north shore of Lake Erie (24, 42, 6, and 3) to Long Point Provincial Park, where we took a day off on Tuesday. 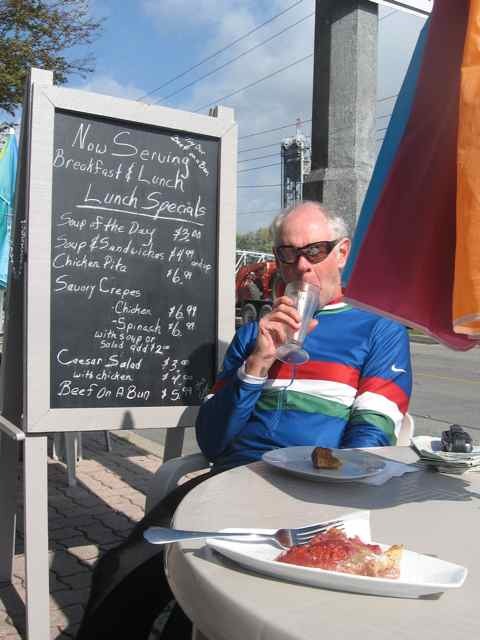 On Wednesday we pressed through a rainstorm to Rocky Point Park, and on Thursday we reached Crystal Beach, near Fort Erie. Then we crossed the Peace Bridge at Buffalo and entered New York on Friday. Colonel Thomas Talbot got a grant of 7,000 acres along the north shore of Lake Erie after retiring from the British military in 1803. He also cut a deal that would give him even more land for every settler he persuaded to prove a homestead there. 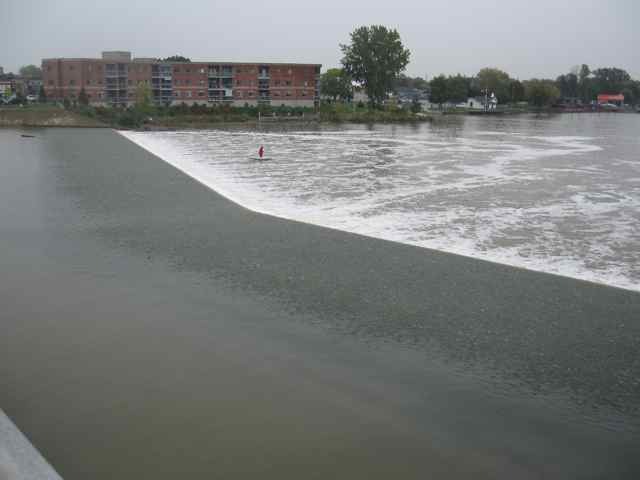 Talbot made the most of the opportunity, building a 300-mile corduroy road along rich farmland between the Niagara River and the St. Clair River. 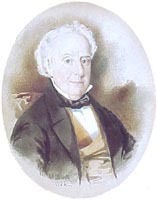 The area was settled between 1820 and 1840, and Talbot was known as “The Benevolent Dictator of the London District.” The region he settled is still one of Canada’s most productive agricultural areas. The road also lead to the development of Buffalo and Detroit. But Talbot never married, so the government took his land back when he died. 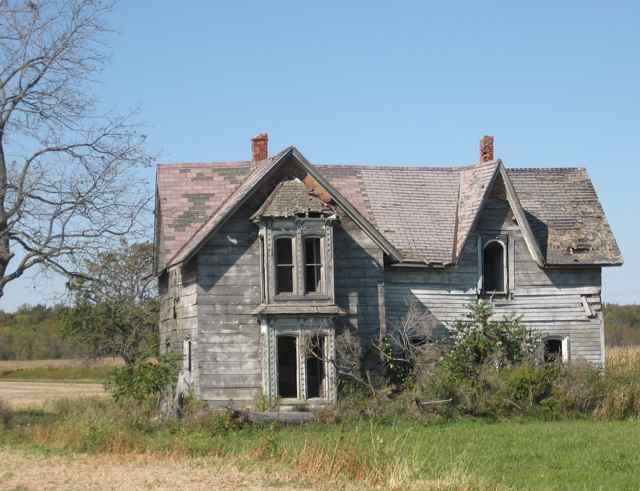 We saw echoes of the original Talbot Trail in tidy mid-19th century brick farmhouses along the route, as well as homesteads that didn’t make it. We slept late on Sunday the 5th because our rides in Ontario should be fairly short, and also because it’s too cold now to ride first thing in the morning. 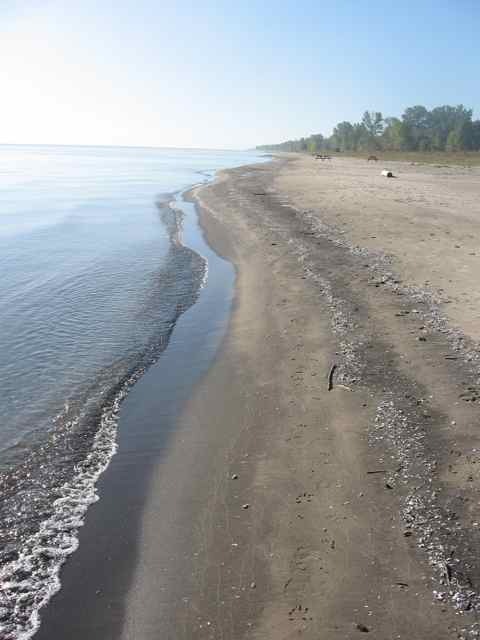 The late start gave us a bit of time to walk down the shore of Lake Erie at Rondeau Provincial Park, which was a revelation. I saw fine sand and miles or unbroken woods stretching southward in a peninsula that juts into the lake. 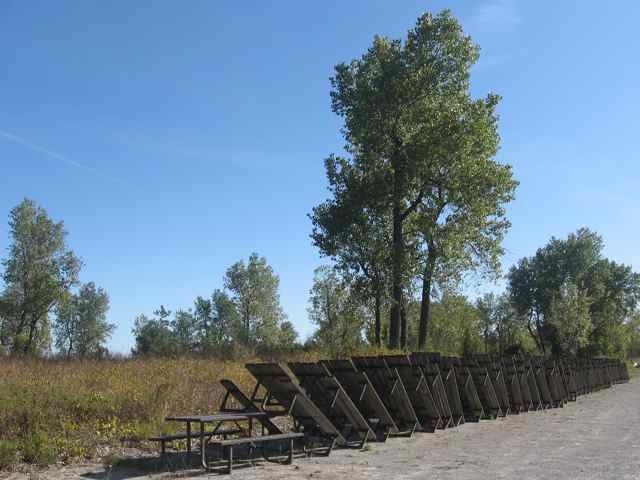 Rondeau is one of Canada’s oldest parks, so the woods here are near maturity and the land has been managed well for biodiversity. It is a beautiful place, and it was nearly empty of people on a sunny Sunday in October. It would be a great place for a long hike. After an unsuccessful attempt to find an internet connection in a nearby town, we ate a late breakfast at a diner in Morpeth and started east on the Talbot Trail. The truck was leaking brake fluid, and we learned from Sara that the leak got a lot worse as she drove ahead of us to our destination, Port Stanley. We needed to get it to a mechanic in the morning. 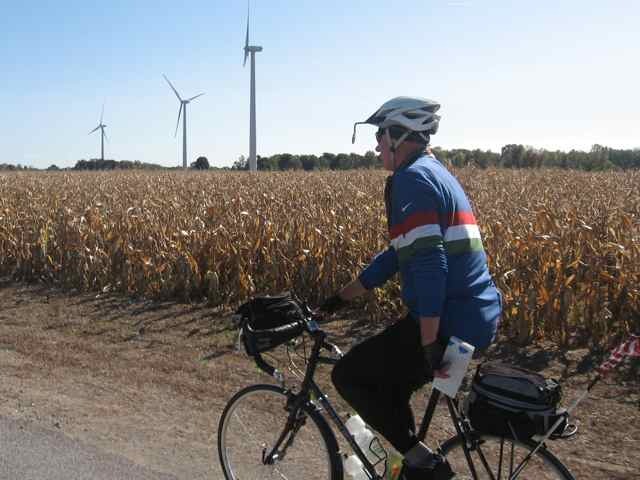 So we rode the 45 miles as fast as we could, passing natural reserve areas and the Lake Erie shore in a few places but mostly staying in agricultural land. I could see enough to understand that this would be a great place for birdwatching, hiking, and lying on the beach. But we had a problem to work out. Port Stanley is an upscale town people describe as “quaint,” which meant that it had no affordable lodging or campgrounds. We re-filled the truck with brake fluid and headed north to St. Thomas, a larger town about 15 miles north. We located a car dealer, a Comfort Inn, and a restaurant, which gave our credit cards a small workout. We fell into bed by 10pm, awaiting the morning’s verdict on the truck. Car trouble stopped the trip and made us anxious on Sunday night. On Monday the 5th, Jim got up early and took the truck to the dealer while Sara and I waited in our luxurious hotel rooms. At 10 am Jim returned with good news: one of the brake lines had rusted through, and the repair was relatively minor and quick. We were back on our bikes by noon. 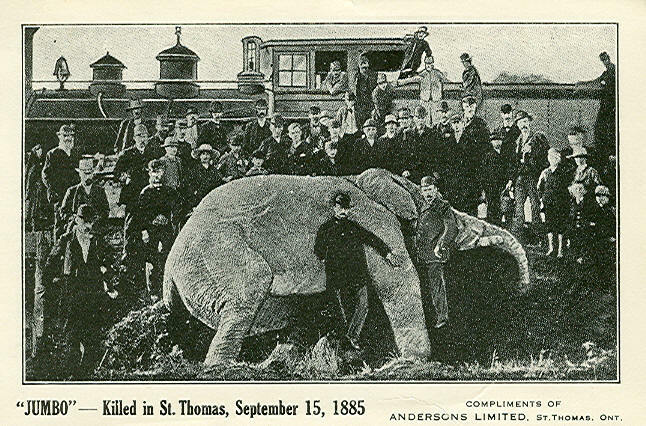 “After the show in St. Thomas, the elephant driver started down the track with Jumbo and the baby elephant, Tom Thumb, to where the Grand Trunk Freight train was standing. There are a great many tracks at that point, used in switching cars on the Grand Trunk Air-Line, which there joins the main track. There was a train and on the other a steep embankment. As a train came around the curve the keeper tried to induce Jumbo to go down the embankment, but he would not. “The reason at first was not apparent. The baby elephant was in the rear, and as the train approached Jumbo began to bellow and swing his trunk. The little elephant seemed dazed, but did not get out of the way. As the engine was closing upon them Jumbo raised on his hind legs as though to protect the baby, and then quick as thought dropped down and grabbed him in his trunk and hurled him with great force over all the tracks and against a freight car, twenty rods away, where he dropped down, whining like a puppy with a sore foot. Jumbo in saving the life of his protégé, entirely neglected his own chance to escape. The locomotive struck him will force in the side, crowding him against some cars on the siding nearest him and fairly squeezing the life out of him. Other sources don’t support the story that Jumbo died trying to save a baby elephant’s life, so this may be another P.T. Barnum tall tale. But like so many of them,it stuck. 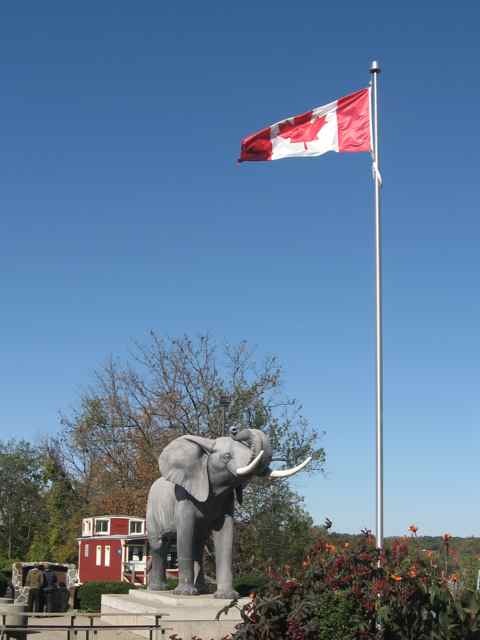 A century after Jumbo’s death, the community collected donations and erected a life-sized statue of the beast on the edge of a high embankment. It is a fine statue and a good story, and it makes me suspect that this must have been the biggest thing that ever happened in St. Thomas. Like Elvis or JFK, Jumbo became bigger in death than he ever was in life. Barnum stuffed the hide of Jumbo and exhibited it for several years, and Barnum is the reason why we now say that something is “jumbo” instead of staying it’s extra big. After Jumbo’s hide stopped drawing crowds, Barnum donated it to Tufts University, where it became the official mascot. The hide was destroyed in a fire in 1975. According to Wikipedia, the ashes of Jumbo are kept in a 14-ounce Skippy Peanut Butter jar in the office of Tufts’ athletic director. 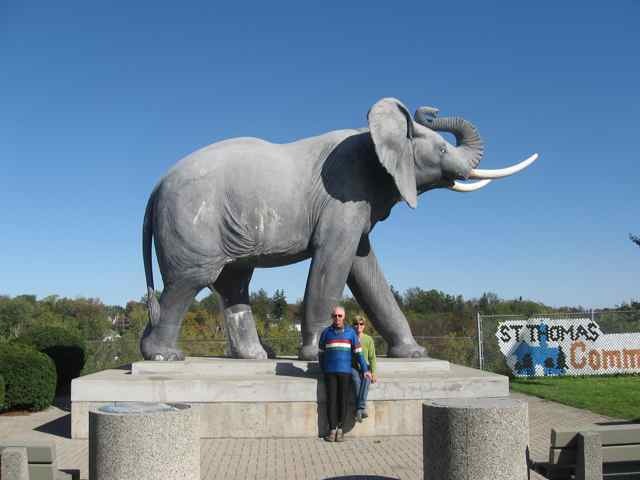 We said goodbye to Jumbo and drove to the provincial highway where we had stopped the day before. We started east around noon, with just 45 miles to go to our campsite at Long Point Provincial Park. The wind had shifted and was coming from the northeast, so we rode into it for most if the day. This slowed us down and might also have made us more observant. The road swung close to the lake and went past well-kept farms harvesting sweet peppers, apples, soybeans, potatoes, and corn. 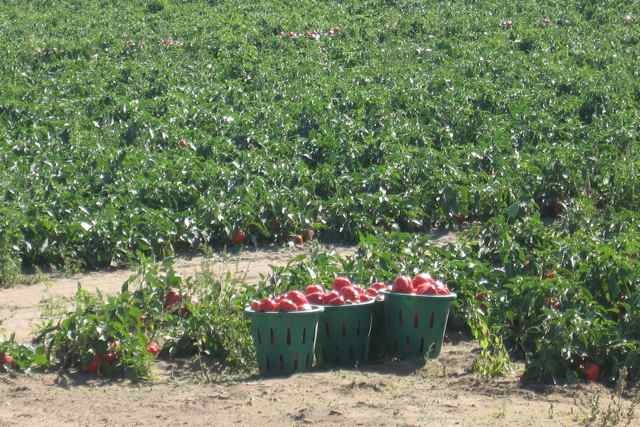 There aren’t many places in Canada where a farmer can make a good crop of sweet peppers, but the north shore of Lake Erie is one of them. Not everyone is happy in this paradise of local food and clean electricity, however. We also saw lots of drying barns for tobacco that had been abandoned. The owner of a small general store in Clear Creek explained that the government had set aside $286 million to buy out tobacco farmers, but the money hadn’t arrived yet and the farmers were running out of options. He also explained to us why the Canadian shore of Lake Erie is not lined with second homes and cottages, as is every lakeshore in New York. 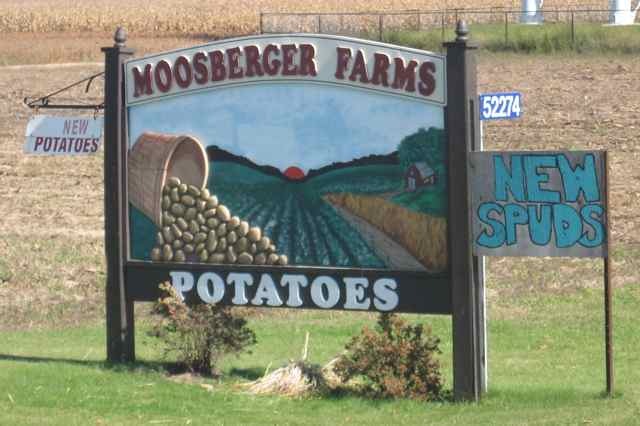 Canadian farmers in this district are prohibited from subdividing their land, he said. Most of the shore is in an agricultural reserve program and is legally required to remain in production. He was not happy about this. It reminded me of the Adirondack Park, a place that city people treasure as a natural jewel while the locals grumble about not being able to make a living. We entered the Long Point Biosphere Reserve, where a 25-mile sand spit that juts into Lake Erie is reserved for the use of migrating birds. The peninsula itself is a mixture of privately owned land that is protected by a Nature Conservancy easement, and a national wildlife refuge that is accessible only by boat. 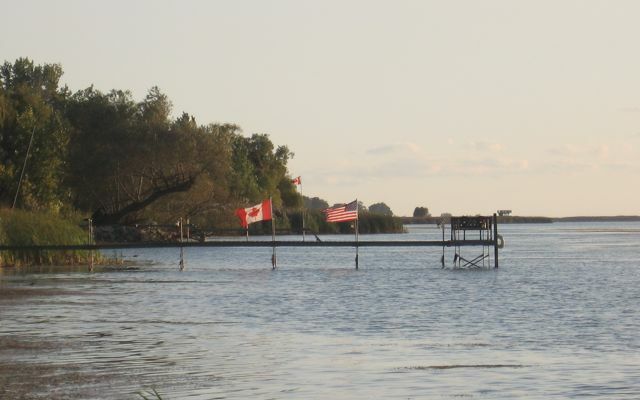 The government of Ontario, local citizen groups, Ducks Unlimited, the United Nations, and even the State of New York have contributed money and time to make sure that this area remains prime waterfowl habitat. 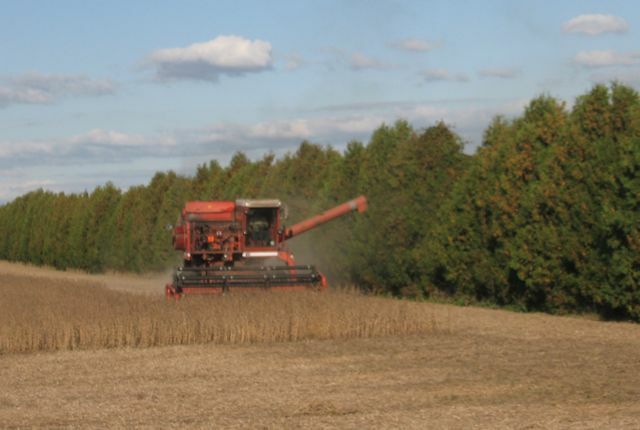 Farms are paid to ensure that there’s lots of waste corn for birds to eat. No-nonsense signs keep you from walking into the bird areas. The fine for trespassing is $225. The star of the show here is the Tundra or “Whistling” Swan, which is pure white except for a black bill and has a eight-foot wingspan. 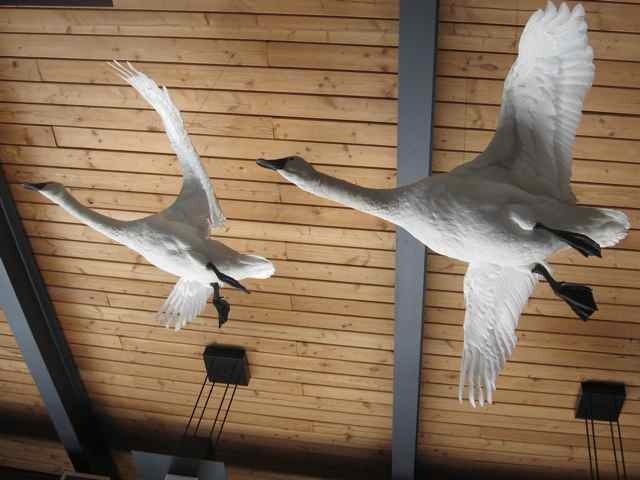 The swans descend on Long Point in late February and stay until mid-March, stopping to rest and refuel on their way from wintering grounds in Florida to their nesting sites in the arctic. When they’re here, the ranger said, they sit in the huge marshes that line the inland side of the peninsula and make an incredible racket. You have to see it to believe it, she said. But the big preserve is a mixed blessing for ducks, because you’re allowed to hunt them. We heard shotgun blasts until dusk. 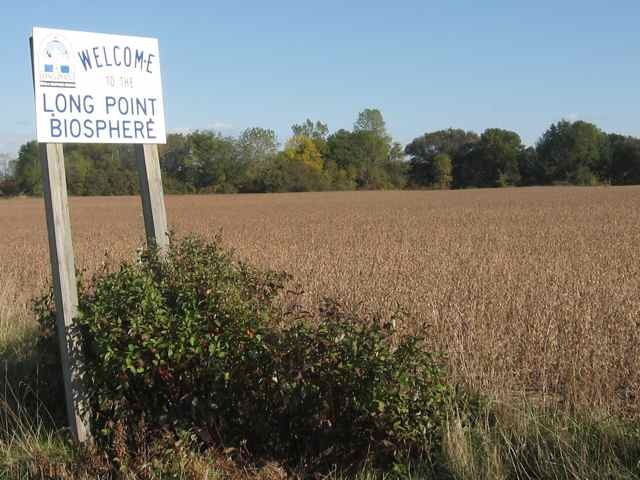 The most remarkable thing about Long Point is that the public is not allowed to walk onto the spit itself. Five or six miles of private land separates the provincial park from the wildlife refuge, which runs to the tip of the peninsula. 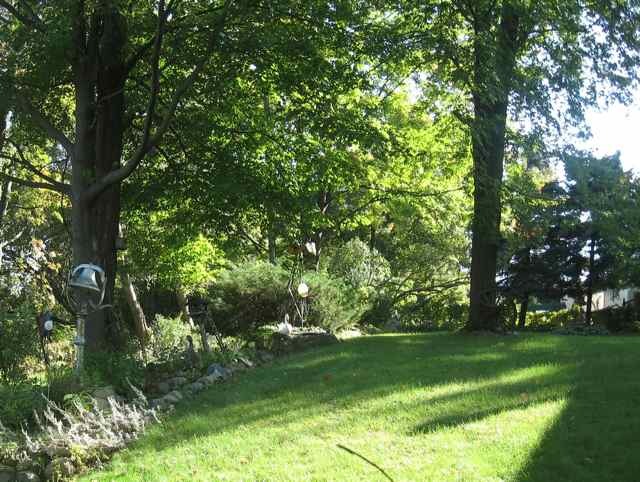 The private land is a hunting camp owned by a group of wealthy Americans and Canadians. 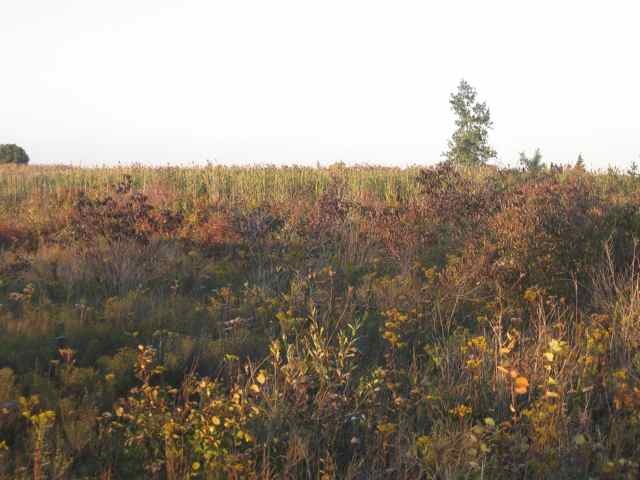 The Nature Conservancy brokered an easement on this land, along with the donation that created the wildlife reserve. Unless you have a boat, you can’t get to the good stuff. Very clever. I was reminded once again of the way land conservation works in the Adirondacks. We took Tuesday off and went into a nearby town to do some errands. We also walked around the Provincial Park, which was about to close for the season and was almost empty. But it was a clear, warm day, which gave me the unexpected but exquisite treat of sitting on a deserted beach in a camp chair and staring at the waves until my brain waves resembled a dial tone. 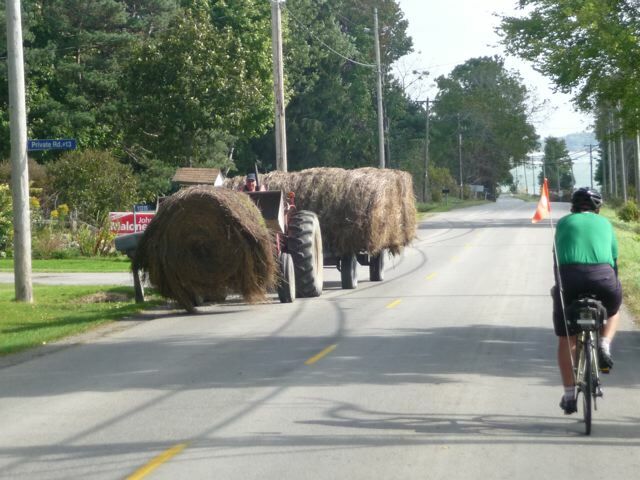 We finish our Ontario ride on Wednesday and Thursday, and on Friday we start through New York. The truck’s left rear wheel wobbled. It was a minor problem seemingly related to the brake adjustment done earlier this week, but we needed to go to the nearest Toyota dealer to have it checked out. So we were up at 6:30am on Wednesday and at the dealer in Simcoe when it opened at 8am. However, we couldn’t produce a shimmy. These things happen and sometimes they fix themselves, we were told. Twas ever thus, we said. We pushed on and went to Tim Horton’s for breakfast. Tim Horton’s is the Canadian answer to McDonald’s. In Port Dover, the small town where we began our ride, the local diners were closed for the season but Tim Horton’s was packed. The food was good enough and the coffee was great. It’s consistent and it’s quick. Signs posted inside say you aren’t supposed to stay more than 20 minutes, or else you’re “loitering.” Something important is lost in this, but you can’t place a dollar value on it. 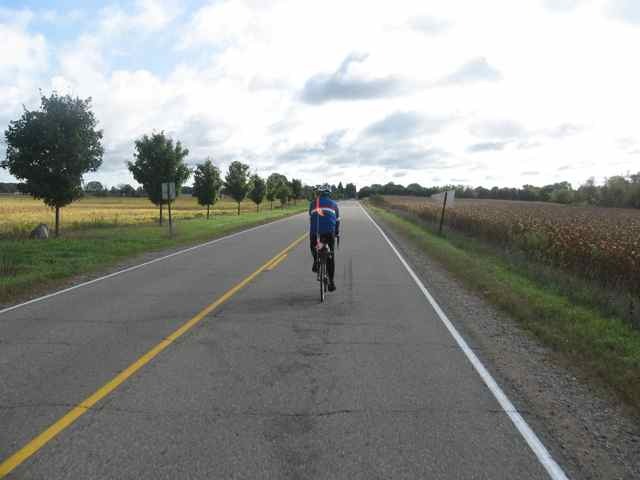 We had about 45 miles to ride to our destination, which was a provincial park east of Dunnville called Rocky Point. 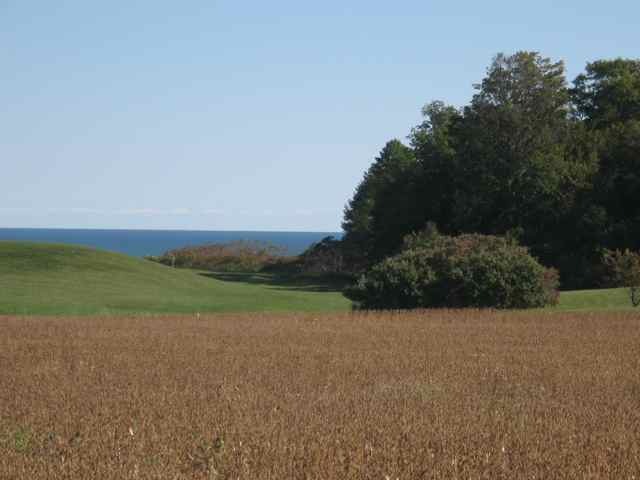 We started off through agricultural fields but quickly noticed that homes were lining the Lake Erie shore at this point, a change from yesterday’s agricultural reserve. Some of the homes were new McMansions and some were old working-class cottages, but they packed every inch of the shoreline. It was what you’d expect to see along a lake in Upstate New York. Then the scene abruptly changed as a large mill loomed in the eastern skyline. It looked like a steel mill. Cyclone fence soon lined both sides of the road. Indeed, it was U.S. Steel’s Lake Erie plant, and it was enormous. We rode through it for over a mile. It had its own pier and conveyor belt, where ships delivered ore from the Iron Range or scrap cars from Cleveland. We noticed no rail lines, so the finished product also had to leave via the lake. East of the mill was an Ontario Power plant, gas-fired by the looks of it, and east of that was an Esso oil storage facility. We were in an industrial landscape for three or four miles. We eventually went back to the more familiar lake cottages and rode along Lakeshore Road, which was very pretty. Lake Erie was just to the south of us, and beyond the houses on the north were agricultural fields. It went on for a good 15 miles like this. But the rain that had been predicted for the afternoon arrived early and made things a little more businesslike. We paused under a tree, put on our gear (jackets, neoprene booties, a baseball cap under the helmet) and pushed on. 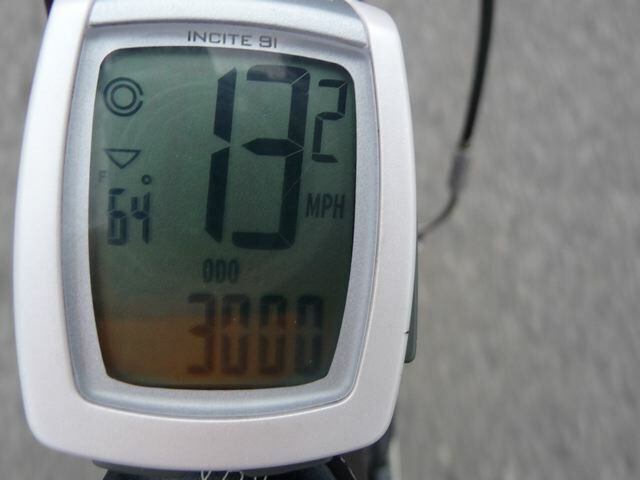 We also paused for a fist bump when Jim’s trip odometer hit 3,000 miles. We sure have been doing this ride for a long time, I thought. The rain continued off and on for the rest of the day. 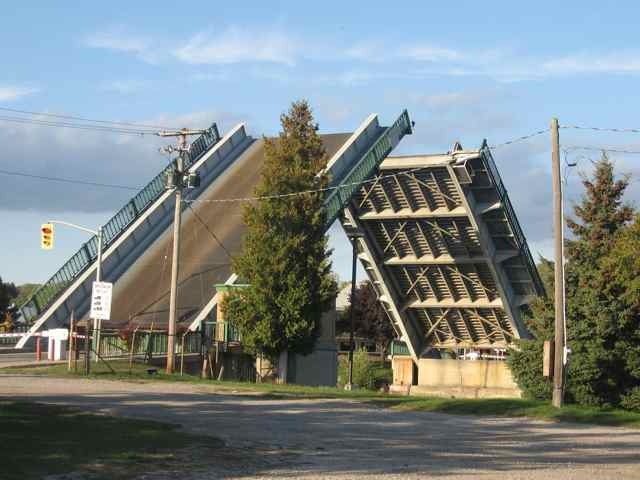 We went through several small towns and finally through Dunnville, where the Grand River empties into the lake and a fisherman stood in his boat just downstream from a weir. We stopped at a grocery store and I watched the bikes while Jim went inside. Women streamed in and out of the store. 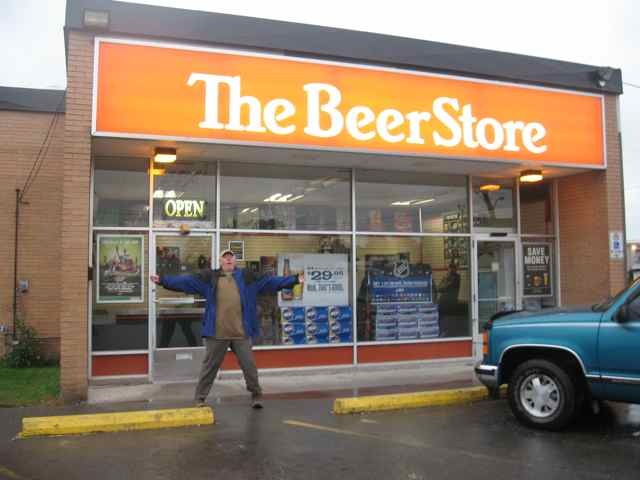 Canada’s Thanksgiving Day is on October 13, and they were stocking up. Thanksgiving feasts were brought to Canada by Tories who fled the United States after the Revolution, but the date (the second Monday in October) wasn’t made formal until 1957. The women paused while a man on a tricycle rode by very slowly, so slowly that an ordinary person would have gone faster by walking. But this man had had a stroke or some other crippling neurological disorder, and he was riding his bike because he needed support to walk. 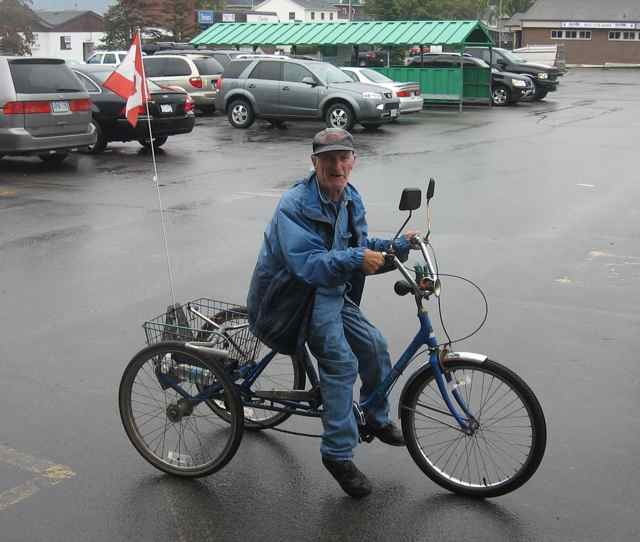 I helped him park the bike, retrieved his footed cane, and set him up behind a shopping cart. He slurred his words badly but said that his name was Ernie and that he lived around the corner; that he went out like this for food every three days; and that it took him about two hours to do it. Then he thanked me and pushed the cart into the store, walking slower and more variably than a toddler. That Ernie is one tough little sumbitch. The rain intensified in the last six miles to the park, and the last two miles were on a sandy road that coated our bikes and clothes with mud. We put up the camper and slowly washed and dried ourselves, cursing the day and moving around in the small camper like sailors in a submarine. Luckily the showers and a laundry room were nearby. After we all regained our composure, Jim and I left Sara in peace and went back into town. We bought beer at a government store and sat at Grandad’s Donut shop, the one place in Dunnville that has free wi-fi. We returned around 6om to find a south wind screaming off the lake at a good 30 miles an hour. Trees sheltered us from this, but the wind-blown rain continued until we went to bed. The rain stopped and the clouds cleared, and we woke up to a blue sky. 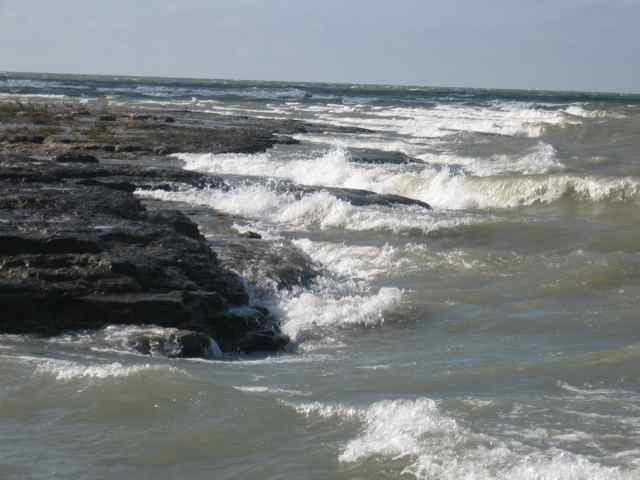 Rocky Point Provincial Park has a sandy beach, but it also has shelves of shale sticking out into the water that give waves an impressive place to crash onto. We had a short day before us, just 30 miles, so we dawdled and dried things out and didn’t start riding until about 11 am. We rode through more cottages and lakeshore roads until we reached the town of Port Colbourne, where the Welland Canal enters Lake Erie. The Canal allows ships to avoid Niagara Falls when they travel between Lakes Erie and Ontario, and we stopped for lunch at a canalside café in hopes that we’d see something big pass by, but no luck. I did observe that Jim looked very Continental in his sunglasses, however, drinking une milkshake. 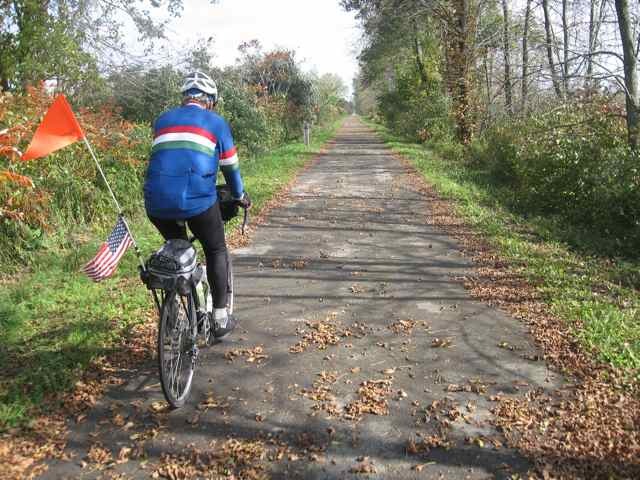 We continued east on the Friendship Trail, a paved bike path that runs from the Canal to the Niagara River. 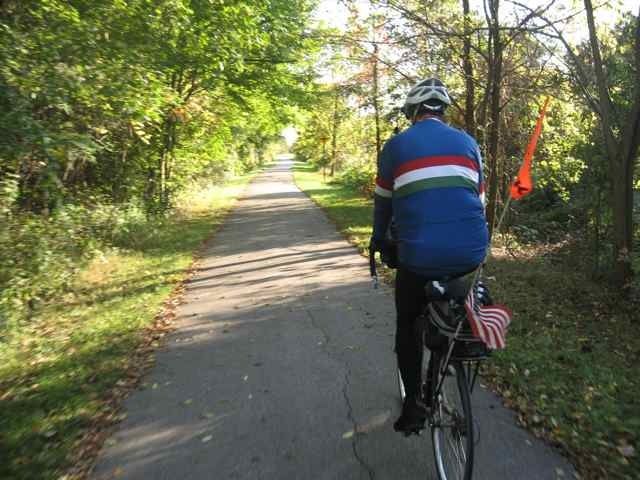 It is part of the Greater Niagara Circle Route, a 90-mile rectangle of mostly paved off-road bike paths that links the canal, the river, and the two lakes. The Niagara Region of Canada is wired for bicycles. It has lots of helpful signs and even a train that can take your bike from Toronto to Niagara-On-The-Lake, so you can ride back on yet another paved path. We rode into Ridgeway and met Jay and Joan Janowsky, two Ithaca friends who own a cottage here. They kindly delivered Tania and her bicycle so she could join the ride for the next three days. Jim peeled off for the afternoon while Tania and I rode to the Peace Bridge and back with the Janowskys. 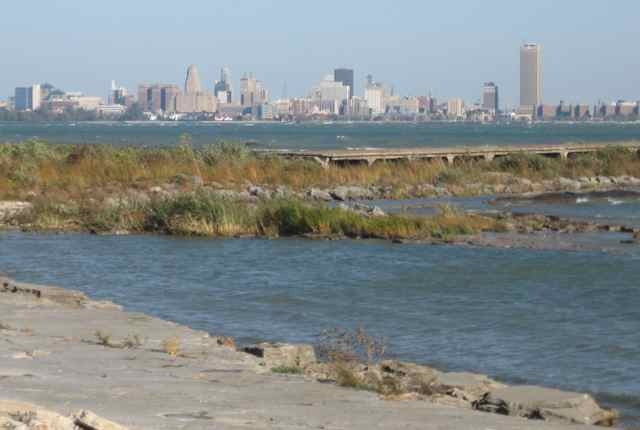 There is a great view of the Buffalo skyline from this trail. We returned to a nice motel, met up with Jim and Sara, had dinner with Jay and Joan and their son, and got ready to start through New York.